KIEV, Ukraine -- Russia is mounting a last-ditch offensive to torpedo Ukraine’s shift toward Europe as President Vladimir Putin seeks to salvage his dream of a common economic space in the former Soviet Union. As Ukraine pursues an accord on European Union integration, Russia has disrupted regional trade and sent thousands of troops for war games on the doorstep of the three Baltic nations that joined the bloc in 2004. The pact is due to be signed next month in Lithuania, alongside similar deals for Georgia and Moldova. The agreement would be the latest step in Ukraine’s bid to break away from its former Soviet master and poses risks for both sides. For Putin, the move threatens to wreck his dream of a continent-spanning economic bloc to rival the European Union. Ukraine is gambling that closer European ties will outweigh the risk of retribution from Russia, which buys a quarter of its imports and supplies it with 60 percent of its gas supplies. Without Ukraine, “it will be difficult to build Putin’s new Eurasian edifice,” Fredrik Erixon, director of the European Centre for International Political Economy in Brussels, said by e-mail. Ukraine, working to overcome a dispute over the fate of jailed ex-Prime Minister Yulia Tymoshenko, plans to sign an Association Agreement and free-trade accord with the EU at a Nov. 28-29 summit in the Lithuanian capital of Vilnius. The pact has been in the works since 2008 and would prevent the nation from joining Russia’s customs union, which so far includes Kazakhstan and Belarus. Russia opposes the European push and temporarily imposed more stringent checks on its neighbor’s exports in August after banning products from chocolate producer Roshen, owned by former Ukrainian Economy Minister and EU backer Petro Poroshenko, the previous month on health grounds. This isn’t the first conflict between the countries. Ukraine has fallen out with Russia in the post-communist years, notably over energy supplies in disputes that have twice halted the flow of gas to European consumers during the winter heating season. 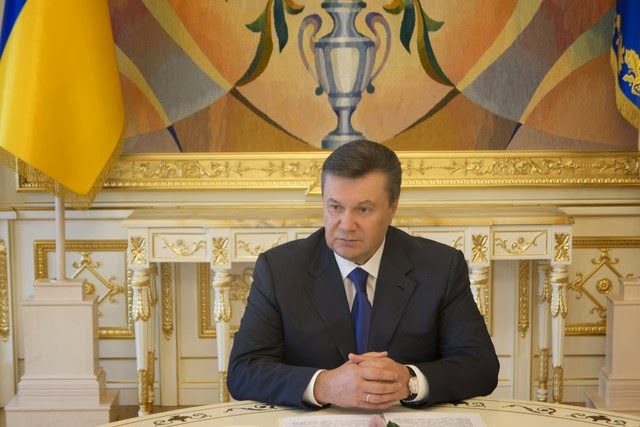 Russia, whose OAO Gazprom (GAZP) covets Ukraine’s energy pipelines, has been offering its neighbor “humiliating” terms to reconsider its gas contract, President Viktor Yanukovych said in August. “The main problem in Ukraine’s relations with Russia has always been Russia’s use of energy to pressure Ukraine,” Yanukovych said in a Sept. 23 interview in New York. The risk of deteriorating relations with Russia was cited among the reasons for a cut in Ukraine’s debt rating by Moody’s Investors Service last month to Caa1, seven steps below investment grade. “Restrictions could impair economic growth and foreign-exchange generation,” Moody’s said. The cost to insure Ukrainian debt against nonpayment for five years using credit-default swaps rose 176 basis points in the past month, more than for any other country tracked by Bloomberg. The spread, which rises along with the amount of risk perceived by investors, was 1,042 basis points yesterday, surpassed only by Argentina. Ukraine sells about a quarter of its exports to Russia and the same amount to the EU, according to the nation’s statistics office. About half of Ukrainians support joining the customs union, a September study by the Eurasian Development Bank showed. More than 90 percent of the free-trade terms of the agreement will be applied immediately after Ukraine completes all internal procedures, according to a statement from the foreign ministry of Lithuania, which holds the EU’s rotating presidency. The accord may boost Ukraine’s gross domestic product by 6 percent and its consumer purchasing power by 11.8 percent, it said in a statement on its website today. Even as OAO Sberbank (SBER) and VTB Group, Russia’s two biggest lenders, organized a $750 million loan to Ukraine last month, Putin warned that closer ties with the EU will have consequences. “If we see that the signed document hurts our market, then we will have to take measures to protect our market,” the Russian leader said Oct. 8. Putin’s administration also raised the specter of a default as a possible result of EU integration. Signing the accord will mean stricter customs procedures for goods crossing into Russia, which will threaten to push Ukraine to a dire outcome, according to Sergei Glazyev, Putin’s adviser for regional integration. “Should Ukraine sign the Association Agreement, its trade balance will deteriorate,” he told a conference in the Black Sea resort of Yalta last month. Russia also held military exercises with about 12,000 troops in the Baltic region in September as Lithuania leads the charge to bring the ex-communist nations closer to the 28-member bloc. Moscow on Oct. 7 banned dairy imports from Lithuania, due to what it said were safety concerns, sending lower the shares of AB Rokiskio Suris and AB Pieno Zvaigzdes, the Baltic country’s two largest dairy producers. On the flip side, Russia is ready to cut a 30 percent customs duty on gas exports to Armenia, the Caucasus country’s government said Oct. 9. Armenia last month scrapped plans for an EU link, opting instead to join the customs union. Reeling in Armenia pales compared with the prospect of losing Ukraine, the second most populous country in the former Soviet Union with 45 million people and a key to Russia’s Eurasian union goal. Putin, a former KGB officer, has called the 1991 Soviet collapse the 20th century’s greatest geopolitical catastrophe. “We have a great inheritance from the Soviet Union -- infrastructure, industrial specialization, a common language and cultural and scientific space,” Putin said in 2011.